How do we find federal statutes? First off, we need to understand that every single law that’s ever been passed by the federal government has been published at one time or another in a set of volumes called the Statutes at Large. The first group, those passed in the early years after the Constitution took effect on 4 March 1789, was gathered up by direction of Congress in 1845.2 The Statutes to 1845 were published first in numbered volumes, and then the laws continued to be published thereafter under contract by a private firm until 1874, when the Government Printing Office took over the task.3 So Volumes 1-17 were published by Little, Brown & Co. of Boston; all the subsequent volumes — now numbering nearly 130 — were published by the Government Printing Office. These volumes are purely chronological: each statute was added in the order in which it became law. So you can imagine that, over time, as statutes were passed and amended and added to, it became harder and harder to find just exactly what the law was on a particular topic. You might have to look in a dozen books to get the answer. Enter codification. That’s a term that means the “process of collecting and arranging the laws of a country or state into a code, i.e., into a complete system of positive law, scientifically ordered and promulgated by legislative authority.”4 In other words, it means taking all of the laws about, say, immigration and putting them in one place, and taking all of the laws saying what’s a crime and what isn’t and putting them in one place. So… where do we find these things? • For early U.S. laws (1789-1878), from the adoption of the Constitution through the Revised Statutes of the United States, the go-to site has to be the American Memory Project of the Library of Congress, at the section for “A Century of Lawmaking for a New Nation: U.S. Congressional Documents and Debates.” Use the direct link to the Statutes at Large and either browse or search the collection. 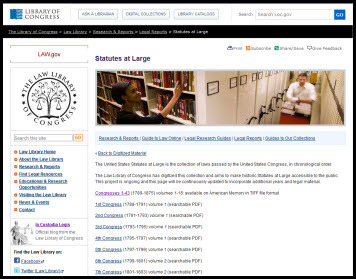 • For published U.S. laws (1789-1950), you can get downloadable PDFs of each volume from volumes 1-81 of the Statutes at Large (sometimes in separate parts) from the Law Library of Congress website. This site contains a link over to the “Century of Lawmaking” area for volumes 1-18, but also allows you to have your own personal available-even-if-the-internet-is-down research library of searchable PDF files on your hard drive. It’s a great resource because the PDFs on this site include the private laws (laws passed for the benefit of a person or family) as well as public laws (laws that impact everyone the same way). • For published U.S. laws (1951-2011), you can get downloadable PDFs of each volume from volumes 65-125 of the Statutes at Large (sometimes in separate parts) from the Government Printing Office (GPO)at this GPO Federal Digital System link. This isn’t my favorite site for a lot of reasons (including an occasional warning from my web browser about the site security!) but it works. • And for the modern U.S. Code (1994-current editions), the entire Code is online at the website of the Office of the Law Revision Counsel of the U.S. House of Representatives. You can search for a specific law or browse a specific title, and you can see earlier editions back to 1994 by using the dropdown menu next in the “Current change” area to the right of the “Browse the United States Code” heading near the top of the page. Does this work for private bills, i.e.m a widow given a pension by a senate bill when her husband’s war records (Civil War) were lost or destroyed on capture of his unit? Yes, private laws are published in the Statutes at Large as well.